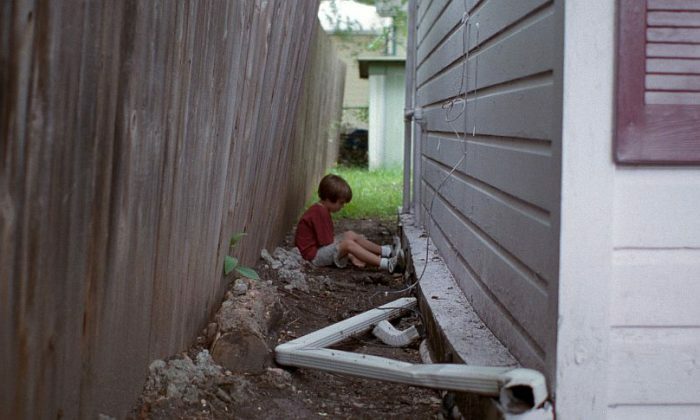 “Boyhood” is to coming-of-age movies what “Act of Valor” is to war movies. The latter used active-duty Navy SEALs to portray SEALs, and “Boyhood” uses an actual boy, filmed over a period of 12 years, coming of age. Nobody’s done it before. Not like this. Is it interesting? Ever see someone age from 6 to 18 in three hours? It’s a game-changer. Groundbreaking, if not exactly mind-blowing. For a few days annually, starting in 2002, Linklater shot 10 minutes of film. He cast non-actor Ellar Coltrane as young boy Mason, Ethan Hawke and Patricia Arquette as divorced parents Mason Sr. and Olivia, and his own daughter Lorelei as Mason’s older sister Samantha. A narrative drama, it feels (surprise, surprise) slightly like a documentary. Mason lives an “average” (lower middle-class, Caucasian, heterosexual) American boy’s life. There’s lots of moving, new schools, divorce, step-dads, alcoholism, bullies, bike riding, poring over lingerie catalogs with buddies, bragging, collecting snake vertebrae, video games, standing in bookstore lines for “Harry Potter” wearing Potter glasses, teenage hobbies, obsessions, first girlfriends, first drinks, and a succession of technologically evolving mobile phones. The usual boy stuff. Which American teen-defining category will Mason fall into? His pouty, ever-so-slightly androgynous movie star looks (hints of Peter Dinklage and Justin Bieber in the facial features) open a few categories to him. His walk is a little awkward as a young boy, so probably he won’t be a natural jock. Is the emerging punky-artsy category the real Ellar? Or is it Mason? Ultimately what we get to see is a normal life captured in a unique new way. Watching someone age 12 years in three hours is slightly magical. So what does it get us, this, nearly three hours of magical normality? What becomes quickly clear is that, while a new format and delivery system, this is classic Richard Linklater territory. It’s not so much new as it is bigger. One of Linklater’s signature moves is to film the same actors over long periods of time; he’s already documented Ethan Hawke aging over 16 years in the trilogy “Before Sunrise,” “Before Sunset,” and “Before Midnight.” “Boyhood” offers more of Ethan Hawke aging over decades. The film is also related to Linklater’s breakout hit, “Slacker,” as well as his cult hit “Dazed and Confused,” insofar as all three films take place in Texas. And deal with youth, high school, and college-age characters, talking in low-key ways about profound issues, reflecting Linklater’s philosophy major background and seeker’s mind. On a comical note, the same actor who played a liquor-store cashier in “Dazed” plays a liquor-store cashier in “Boyhood.” Another tribute is the 1970 black Pontiac GTO that Hawke’s character drives. “Dazed” had the same make, in yellow. Linklater must’ve driven a “Goat” in high school. What does this 12-year device/artifice, this gimmick—ultimately bequeath us? Could 3, 4, or 12 different well-cast actors show us Mason growing up? Sure. They could tell us the same story. Watching Ellar grow up on screen is authentic in the sense that real SEALs—not acting but doing—are authentic. It becomes a genre unto itself. Of course, memorizing lines someone else wrote is acting. But what do we stand to gain from this particular brand of aging-authenticity? We pay homage, in this case, to the director’s (and cast and crew’s) commitment to a new, time-devouring, paradigm-shifting attempt at evolving the art of storytelling. All Linklater’s films are studies in banality, ringed round and infused with a quiet call to enlightenment. He’s clearly an advocate of learning to live in the moment and cherish the present. And yet one senses Linklater’s ongoing awareness of paradox, namely that learning to stand still in the now might actually constitute a journey leading somewhere else. He’s just not sure what road to get on, and which color Goat to drive there in. Perhaps, now that there’s been a “Boyhood,” next up will be a “Manhood,” and we’ll get to watch Mason’s manhood rite of passage. Maybe in the making of that film, Richard Linklater will find what he’s been looking for.